I hope this finds you well in every way. And I hope you are finding ways to stay cool and beat the summer heat while helping our animal friends to do the same! I have not shared with you on this blog in FOUR months! We’ve had a lot on our plate since my last post. But today I am very excited about something in the skies, so I am making time to share. This will be a short post because we are still unpacking and getting settled after our PCS (Big Move) from the west coast to the east coast! Since we are still in the swing of Summertime, I thought this would be fun to share with you. I hope it inspires you! The expression “dog days of summer” was not originally referring to the oppressive heat and laying around like a tired dog in the summer. It actually refers to the period from July 3 through Aug. 15 when the “dog star”, Sirius, holds a most prominent position in the nightsky! Sirius is nicknamed the “Dog Star” because it is part of the constellation Canis Major, which is Latin for “the greater dog.” Eventually the phrase “dog days” was poorly translated from Latin to English about 500 years ago; taking on a new meaning. For centuries, the effect of Sirius’ light with the combination of our Sun’s energy was understood to have an effect on all life on Earth. In Egypt, Sirius’ return to the night sky became a precursor to the annual flooding of the Nile, and was associated with the goddess Sopdet. In Greece, the sighting of Sirius was the precursor to their hot summer and thunderstorms. Today, this star is still considered powerful to life on planet Earth. Sirius, located in the Canis Major constellation, can be considered directly ‘upstream’ from our solar system in a cosmic sense that refers to its relative position in the Milky Way galaxy. A highly-charged stellar field, it is said to be currently bringing in high-end electromagnetic currents into our solar system, affecting the solar activity and planetary vibrations of every celestial being on Earth. It’s also known to be directly involved in the 8/8 Gateway that we are all currently in now. When stars reach the end of their evolution, smaller stars—those up to eight times as massive as our own sun— become “white dwarfs.” These ancient stars are incredibly dense; a mere teaspoonful of their matter would weigh as much as an elephant. This picture is an artist’s impression showing how the binary star system of Sirius A and its diminutive blue companion, Sirius B, might appear to an interstellar visitor. Even as a dwarf star, Sirius is the brightest star in the night sky, even though it’s 8.8 light-years away from Earth! The Sirius system is the fifth known closest stellar system. Sirius observes a period of almost exactly 365¼ days between risings. Although this incredible star continues to return to the night sky in late summer, its position continues to gradually shift relative to the Sun. Several millennia from now, this astrological event won’t even occur during the summer. Roughly 13,000 years from now, Sirius will be rising with the sun in mid-winter. Scientists say that in 26,000 years, the dog days will completely move all around the sky. Stars like our sun fuse hydrogen in their cores into helium. White dwarfs are stars that have burned up all of the hydrogen they once used as nuclear fuel. Fusion in a star’s core produces heat and outward pressure, but this pressure is kept in balance by the inward push of gravity generated by a star’s mass. When the hydrogen used as fuel vanishes, and fusion slows, gravity causes the star to collapse in on itself. Sirius B is the nearest known white dwarf star to Earth. Have you noticed a very bright, twinkling star in the predawn/dawn sky? That star is Sirius. It’s so bright that, when it’s low in the sky, it shines with glints of red and flashes of blue! Sirius is highly visible in the Northern Hemisphere night sky because it has a high relative luminosity to other stars, and it’s relatively close to Earth. If the star were placed next to Earth’s sun, Sirius would outshine our sun more than 20 times. To find Sirius, use the belt of Orion as a pointer. The three stars point downward toward Sirius to the left. Orion the Hunter and Sirius the Dog Star. The very noticeable constellation Orion the Hunter rises before dawn at this time of year, recognizable for the short straight line of three stars that make up Orion’s Belt. And the sky’s brightest star Sirius – sometimes called the Dog Star because it’s part of the constellation Canis Major the Greater Dog – follows Orion into the sky as the predawn darkness gives way to dawn. Orion and the nearby star Sirius will become visible in the evening by northern winter (or southern summer). But presently the Hunter and the Dog Star lord over the southeastern sky at dawn’s first light. If you are into the stars and the night sky, I highly recommend getting the Sky Guide App. I wish I had this as a kid. I used to lug my huge telescope around the neighborhood at night. This is much easier! 😀 It is So Cool to see constellations so clearly on your phone! And the Sky Guide automatically adjusts to your viewing direction so you can easily identify stars, planets, constellations and so much more! You can see a demo here. Also, if you were not aware, the 2018 Perseid meteor shower peaks this weekend. The upcoming new moon on August 11 guarantees darker nights, so it’ll be easier to see. The Perseid meteors tend to be bright enough to be seen in suburban skies. Sky Guides are saying the mornings of August 12 and 13 are best for viewing, but August 10 and 11 will be good, too. Check out these tips for watching 2018’s Perseid meteors! I know this a switch-up from my usual posts about animal behavior, training, and enrichment, but this is no less important. I have discovered that when we allow wonder to permeate our being, this sense of wonder and awe flows into all other areas of our life. When we choose to see life through the eyes of a child, filled with wonder and awe, transformations occur. When we set out to see new sights, our perceptions change. If we are willing to see things differently, we change, as does the world around us. I hope that you will create space to view the beauty of space with your beloved animal companions. May the nightsky and the bright lights within it remind you of the Light within you and your animal companions. Blessings to you and your beloveds! And Happy Summertime! Disco, Dart Frogs, Cats, and Canines! Considering the current state of affairs around the world, I thought we could all use some levity. We all need a break from the fear, hate, insanity, and the seemingly never-ending drama. This post serves to give you just that. As promised, I will be swaying between science and spiritual stuff U.F.N. 😉 Since my last post swung to the spiritual side, I thought we could dance to a different beat today! And once again, I am grateful you are here. I have to mention; the grammar nerd in me got a kick out of playing around with the comma placement in the title of this post. If you were confused, this post isn’t about disco frogs, disco cats, or disco dogs, but it does involve these species, with a touch of the genre of music I just adore: disco! I appreciate that this genre of music isn’t everyone’s preferred choice. But since I am a child of the 70’s I have a super positive association with DISCO that stems way back to childhood and well into high school. From rocking out to The Bee Gees in the backseat, to breakin’ it down until the break of dawn with my girlfriends; Disco was my dope. It was a natural high for me. Even to this day, if I am in a funk, I play F U N K! Disco can get me movin’ and groovin’ unlike no other music! Play me some Soundgarden or Bob Marley and I am ready to rock-n-roll or love everything around me. Put on “Super disco, disco breakin” by The Beastie boys, and I am amped! But when real old school Disco starts to play … watch out world … my sass emerges and I am ready to shake-that-aaaaaa … !!! Ok, you get it. 😀 The right kind of music can totally shift me out of a funk. And as someone who has suffered from depression, anxiety, and chronic pain for more than half of my life, music is my medicine. But I am not unique in this way. We are all moved by the right kind of tune. Music shifts our mood. Chemical reactions occur. Endorphins are released. Music promotes positive movement, and dare I say, healing? Movement Shifts Energy. When we physically move the body, it supports and facilitates the movement of Life Force Energy. When the physical body moves, the energy shifts within. This is not woo; it’s legit. Science has yet to prove this fact, but Eastern cultures have known this for centuries. Our western world is just catching onto this fact. But this fact is not limited to humans. Because physical movement shifts energy, physical movement supports the chakras of all living beings. Animals of all shapes, sizes and species benefit from positive movement and motivation. But are we, as animal guardians, providing this opportunity enough? Back in another life, during my Audubon Zoo Dayz, I was an Enrichment Coordinator. Providing species-specific enrichment for everything from parrots to poison dart frogs was my passion! So now, providing this necessary, science-based enrichment for companion animals is second nature to me. My hope, is that once you learn how, this will come naturally to you, too! Knowing how to do this is vital if we want to provide a healthy environment for our animal companions to thrive in captivity. blue poison dart frogs (Dendrobates) enjoying novel multi-sensory enrichment (hunting for fruit flies out of a seasonal pumpkin) Seriously. How adorable are they? So what do poison dart frogs have to do with disco, cats, and dogs? A lot, actually. We now know that offering a coconut foraging feeder to captive Dendrobates (poison dart frogs) produces new behaviors. This particular kind of enrichment feeder produces the greatest increase in frog activity in both traditional and new exhibits. The increase in mobility is most likely due to a coconut feeder’s complicated nature, which randomizes the release of insects into the exhibit. The complexity of the enrichment increases both mental and physical aspects of the frogs. Now think about how we can create something like this at home or in shelters, and why it’s so important. If something as simple as placing prey (fruit flies) in a coconut feeder for frogs to foraging and hunt from, creates more desirable behaviors and healthy mental stimulation, what can we offer to our companion animals?? They key is to make things simple and safe, but challenging for the animal. Create choice, offer control, and add complexity. 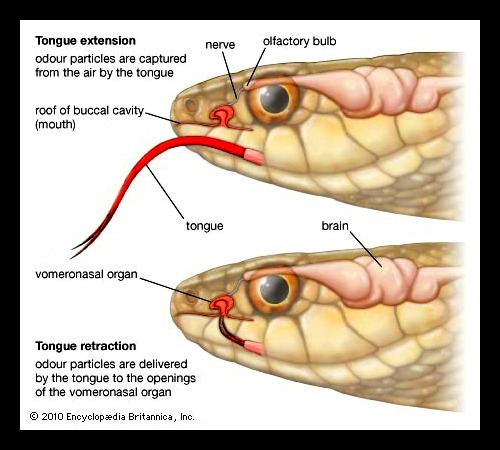 The goal is to elicit species-specific behaviors and to stimulate their natural abilities, senses, and enhance cognition. This is what proper enrichment offers. 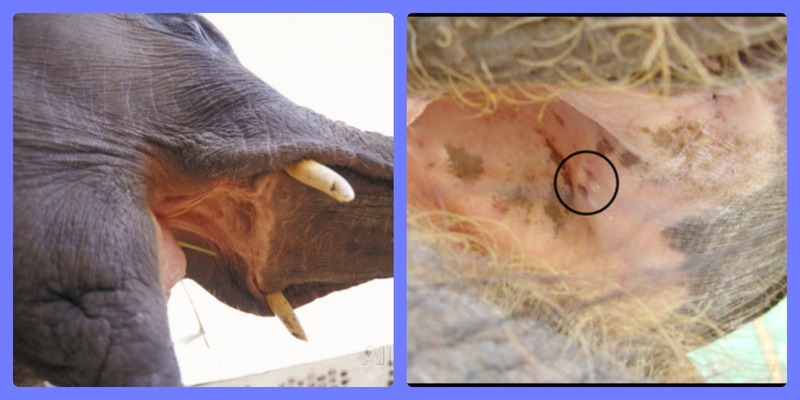 Enrichment is as integral to animal care as veterinary and nutrition programs. 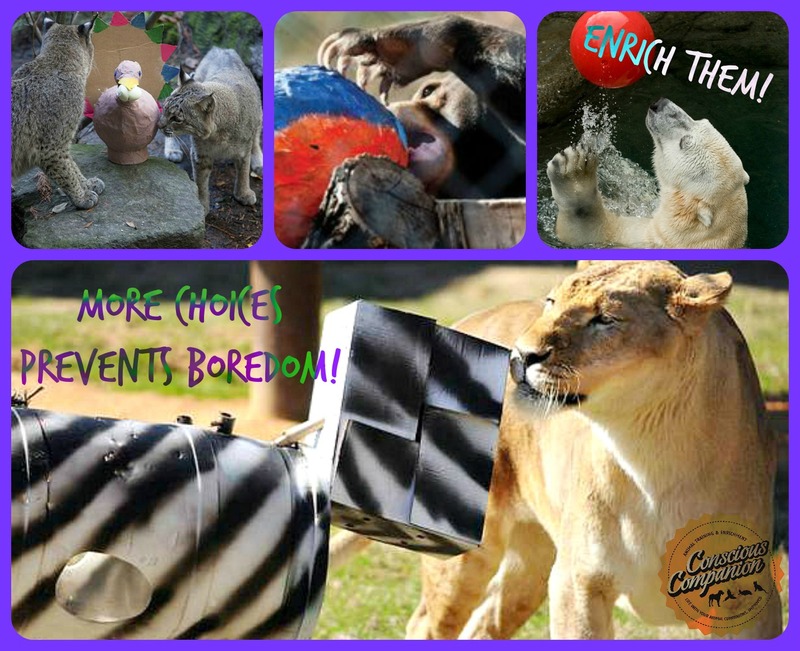 The scientific principles in which structured enrichment programs are created are not reserved for lions, tigers, bears, and sea lions in zoos and aquariums. And considering the high number of unhealthy pets in homes, increasing behavioral problems, and animals surrendered to shelters every week, I say we aren’t doing enough enrichment. But we can change this. And when we do it will shift everything. Not only will we shift the energy within the animal, which will result in healthier bodies and minds, but we will create a more empowered way of living for each animal within the home. We will also shift the energy between guardians and the animals. We create a total shift for everyone on every level. There is enough craziness and fear unfolding around the globe. Why don’t we bring some joy and humor into our home? Why don’t we pull our focus from that insanity and consciously create really fun but safe ways to shift the energy with our animals? There are amazing souls right under our nose! Let’s engage with them more! Let’s focus on the joy and love that’s waiting for us! That is where we can choose to focus our energy. Creating fun games that are tailored for the individual animal/group are one way that we can pull away from the drama and fear in the world and create harmony at home. We can create our own music that moves us all! Music moves us and gets us groovin, but what can we offer our animal companions to get their bodies and minds movin’ and groovin?? Enrichment is “the act or process of increasing the intellectual or spiritual resources”. All of that is so important, but one of my favorite by-products of proper enrichment is the bonds it strengthens. – both between animals of the same species and between different species. This has been a powerful tool in our home. One of our favorite ways to shift the energy of our group while building bonds that last is by providing species-specific enrichment every day. For the 3.0 cats (3 males) and 0.1 dog (female) in our family, this was not only a way to shift stagnant energy in their body, but it was a tool to build a bridge between them. We created conditions to create a fun, harmonious, and happy home. Hocus Pocus and King Albert once had a very combative relationship, but these kind of enrichment activities (and other tools) have dramatically changed their relationship to one based on trust. Physical challenges in older animals were addressed and healing occurred. Minds were stimulated and stagnation faded. 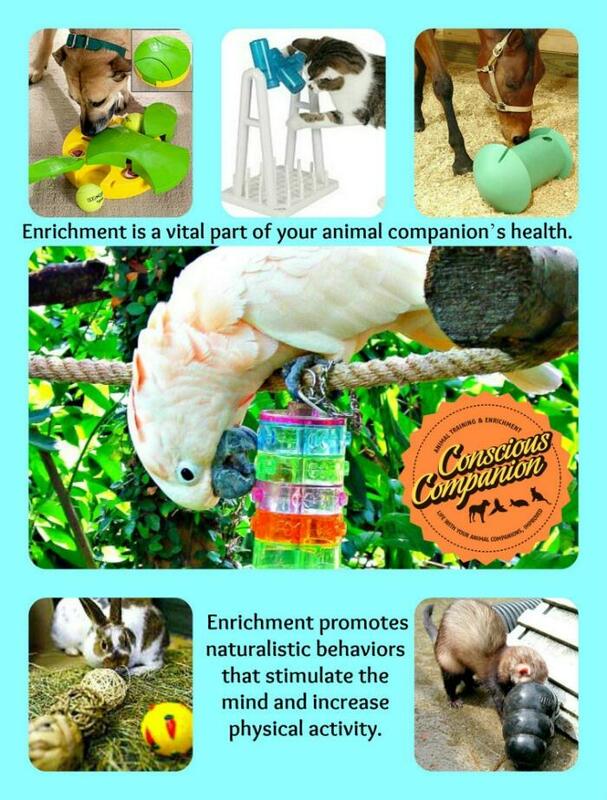 Behavioral enrichment is the environmental enhancement of the lives of animals in a managed setting by providing them with mental and physical stimulation to increase natural and healthy behavior. In the short video below, “Wake-and-Hunt” (not to be confused with Wake-and-Bake) 😉 you will see one example of how we do this. Of course the cats and dog aren’t dancing to disco while they do these foraging activities, but you can see how excited they are to participate! Seeing their energy shift from stagnation to determination, and boredom to curiosity, is similar to shifting our energy via the right kind of music! We just need to find the right tune and melody, so to speak, for each individual. Seniors, in particular, really need to be encouraged to behave, explore, and be stimulated in constructive ways that mimic the experiences they had when they were younger. Nose work is one way that we can do that. For 18 years I have been creating I.E.P.s (Individualized Enrichment Programs) for animals of all shapes, sizes, and species, so it’s now second nature to me. I often forget that this kind of program isn’t in everyone’s go-to-tool box. But it should be! I believe that proper, individualized, species-specific enrichment can be more powerful than basic training. Choice, control and complexity are key. Providing conditions in a captive animal’s environment (home, shelter, zoo) that parallels a life were they would normally have endless choices is empowering. It’s life changing! Science and experience have proven that by providing this for all species of animals living in captivity, we have the power to reduce and eliminate a myriad of medical and behavioral issues. When we create conditions that enhance cognition, encourage movement, and improve overall well-being through resources that tap into the individual species’ senses, we can change lives! You can View one example of how we created an I.E.P for one of our geriatric cats here. You can view another IEP for our younger cat here. You can download an overview of our Guidelines for planning an Individualized Enrichment Program here. We need to ask important questions BEFORE providing this kind of food enrichment. A successful food enrichment program is goal-oriented and considers The Big Picture. Do we have a goal in mind? Is the enrichment for one cat? Multiple cats? A cat and another species? What behaviors of each do we want to encourage? How will these behaviors be encouraged? Will the foraging enrichment be created (or purchased)? How will we implemented it? How will we evaluate the response and the effect? Are there any diet restrictions? Is there any oversight that should involve a feline nutritionist or a feline health practitioner? Are we utilizing the 5 categories of enrichment? – If not, why? You might have noticed that I am highlighting cats in this post. I am because the majority of people believe that cat’s don’t need as much mental and physical stimulation as dogs. But this is untrue and very harmful. Another misconception is that senior and geriatric cats don’t need to get moving daily. Friend, they DO! • Cats far outnumber dogs in homes (96 million cats vs. 83 million dogs). • Cats are mislabeled as low-maintenance pets. • This leads to cats housed in suboptimal environments. • Cats are the number one animal euthanized at shelters due to “behavioral issues”. When the environment of house cats don’t match the conditions they need in order to thrive, medical and behavioral issues arise. Medical issues lead to behavioral issues which leads to a stressful household. It can be a vicious cycle. All of this can lead to a weakening of the human-animal bond, which often results in the owners surrendering the cat to a shelter, tossing the cat onto the streets, or euthanizing the cat. The Reality is that house cats and their conditions don’t match. The conditions house cats are kept in are often the least natural to their species. Our feline companions are very similar to their closest ancestor, the African wildcat, in terms of their behavioral needs and instincts. Therefore, the conditions of house cats should parallel those of their closest wild ancestor, the African wildcat. Scent is another biggie that’s overlooked in companion cats. A cat’s sense of smell is 40x stronger than ours. 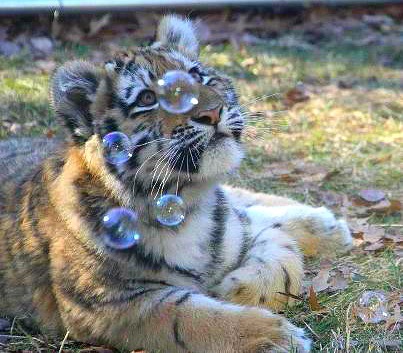 Scent is crucial when it comes to social situations, locating prey, and maintaining safety. Scent is also crucial when it comes to evaluation of food. If more cat guardians gain a better understanding of the vital role that scent plays in a pussycat’s life, they can use this tool to enhance their feline friend’s life! Providing various scents for cats to find is very enriching to cats. We can use everything from catnip to canned food. Some other great options are silver vine, honey suckle, local bird feathers, potting soil, beach sand, etc. Encouraging cats to harness these innate abilities and natural instincts is necessary. Senior and geriatric cats, in particular, really need to be encouraged to behave, explore, and be stimulated in constructive ways that mimic the experiences they had when they were younger. Nose work (like you saw in the video above) is one way that we can do that every day. When we set the scene for a cat to use his/her exquisite senses we are helping our house cats to live a life worthy of their ancestors. We are allowing house cats to THRIVE. That is why we provide these kind of fun enriching activities every day! Animal guardians can learn about who their pet is as a species. We can learn their individual hunting styles, personal preferences, and dislikes /fears. Guardians can provide proper species-specific conditions inside their home that parallel the animal’s natural life in the wild. People can learn how to help their companions to thrive inside! We can change lackluster homes into thriving environments! We can enhance the lives and longevity of our animal family members! We can enhance the bond between animals and their guardians! We can build bonds between every species in the home! We can keep animals in homes. We can Build Bonds That Last! My challenge to you is to allow yourself to let go of the drama and stress of life by creating a peaceful kingdom at home. Let laughter and joy become the centerpiece of your home. Create memories that last, well after your beloved moves on. Create harmony by enriching their environment … and yours. There doesn’t need to be any pressure. There is enough pressure in this crazy world; we need not add any to our life. The idea is to create therapeutic, enriching, and fun activity time together every day. We all need more fun! Funk it up! Help them get their groove back! And yours! Create the time to add in more playtime, more ways to bond, and to release the stress of life. Together. I am curious. What kind of fun mental and physical games do you play with your animal companions? What has worked well? What kinds of exciting enrichment opportunities will you create this week together? My hope is that you will choose to create moments of joy together and memories that last forever. My hope is that you will create your own musical masterpiece together and dance to your own tune. My hope is that you will turn to your beloveds when the world is too much with you. My hope is that you can find peace within your animal kingdom at home. Let your animals be your greatest teachers. Let go and remember to laugh with the ones you love! When I was working at Audubon Nature Institute my coworkers and I used to lovingly joke about a “rambling” coworker. One of our colleagues had a tendency to ramble on and on for what seemed like an eternity. And those of us on the receiving end of the ramble would totally zone out. I mean, we would completely check out. Gone. We would mentally leave the situation. But we were clever enough to appear as if we were listening; we would chime in with a word or nod every few minutes and say something along the lines of “Oh”, “wow” , “huh”, “really”, or “yeah”. We faked as if we were there, but we were mentally checked out. As rude as what we did may sound, it’s all too common for most people when they are bored, distracted, or worried about either something that just happened, or what might happen later. We fake that we are listening, or we fake that we care. We fake interest in the person, the topic of discussion, or the situation. We fake that we are actually there with the person as they are sharing. It’s a rare event for people to be truly present with others. Let’s be honest: We are faking it all the time with people. But we also fake it when we are with our pets. My Mind is Either Full or Mindful. As a highly creative person, it can be an enormous challenge to be fully present. I will get these amazing insights or inspirational ideas while someone is talking to me, or when I am doing the dishes or feeding the animals. As great as that inspiration may sound, it’s not the best use of my mind. It’s not mindfulness. And it’s not helpful or respectful to the ones who are choosing to share their time, presence, or insight with me. But I can train my mind to be mindful. I can practice being fully present, even if what I am doing or listening to is boring or tedious. Or I can practice being bored and distracted. I can choose to focus on what’s right in front of me. Or I can choose to zone out. I can choose to be consciously aware of where my mind is, or I can choose to not care. I have that choice, and you do too. Animals are mindful. Their minds are not full. Take a look a the image at the top of this post. Look at what is in the man’s mind. Then look at what is in the dog’s mind. The man’s is cluttered and full of his worries, wants, and concerns. The dog’s mind is focused on exactly what is in front of him/her. The dog is no where else. The dog is fully present. The dog is taking in the sight, scents, and experience of being right there, in that field with his/her person. Animals have the conscious ability to be fully focused, and fully present. And they practice this at every opportunity. It’s truly extraordinary. And we can learn from their practice and habit of being mindful. In fact, recently, Hocus Pocus had some insights to share with me on this very subject. You can read her wisdom here! I’m pretty sure that Hocus Pocus is focused. Her mind is not anywhere but Right Here Now. We Are Missing Out When We Are Not Mindful. If you are asking, So what’s the big deal about being fully present? then you are right were I was many years ago. You are starting to at least question your behavior and thoughts. 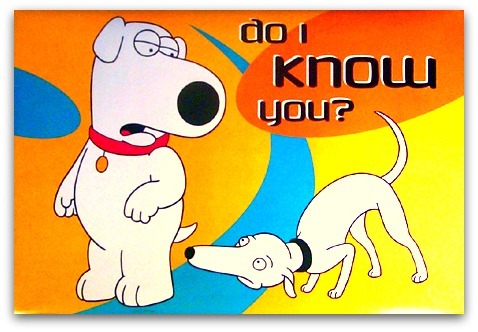 Asking that question and learning the answer is how we start to become more aware of our presence (or lack of) with our animal companions. Over a decade ago when I first started consciously practicing mindfulness in my day-to-day activities, I was appalled at myself. When I slowed down and noticed my behavior and thoughts, I started to observe how frantic, chaotic, busy, and random my thoughts were. My mind was more like a mindless monkey machine. I wasn’t focused on anything that was in front of me. I was anywhere in my mind, but right there! I was missing out on life. I was not even present and absorbing all that was happening right in front of me! Mindful or Mind Full Walks? One area that I noticed I was really mentally checked out was when while walking my dog. I was dismayed to discover that I was in my head the entire time on our walk. I found myself wandering off in my mind, thinking about so-and-so at work, planning my next day’s events, how I wish I had said blah-blah blah in that meeting, and so on. I was pursuing my own agenda. I was stuck in the past. I was fixated future. I was not fully in the present with my dog. Eventually I noticed that while I was mentally absent, I wasn’t paying attention to my dog at all! I wasn’t focused on what she was doing, what she was sniffing, what she was looking at, what she was reacting to, or where she was choosing to walk. As she walked down the sidewalk sniffing and popping her head up every so often I noticed that the walk wasn’t about her at all. The walk was about the distractions in my head. It was about me and all the things I wanted, fretted, and worried about. I was there with my dog physically, but my mind had left her. She was essentially walking alone. One aspect I love to address with clients is helping them to notice where their mind wanders. An easy way to determine their ability (or inability) to be fully present is when they are relaxing at home. Relaxation time is an important tool. This tool can help an animal guardian recognize “where they are” because this is the window to where their mind goes, when they can allow themselves to relax. If they are in the habit of allowing themselves to sit down and relax for at least 20 minutes a day, then we start there. People soon learn if they are able (or unable) to maintain focus on their animal while doing something as simple as petting them, or just sitting with them. They can start to ask themselves questions such as, While I am petting my dog or cat, am I really focused on what’s happening right here now? Am I distracted about what happened today or what will happen tomorrow? Is my dog (or cat) even enjoying this? Am I? Is what’s happening “out there” more important than my friend at my side, or in my lap? As silly as those questions may seem, they are a window to where your mind is. That’s the answer to where you are mentally. If we are making time for “down time” every night, we can start to look at where our mind goes when relaxing with our pets. If you can’t even focus on your pets while you are relaxing at home, with no distractions, how are you going to be able to focus when it gets hectic or when things go awry? How will you be able to be fully present when they are nervous, afraid, reactive, sick or injured? Being able to be fully present with your pet when you are relaxing is a precursor to being fully present during more challenging times. If you can’t mentally connect with your pet on the couch, then you certainly aren’t going to be fully present and connect with her during a walk, when she is becoming anxious, fearful, or reactive, at the veterinarian, or even during a simple training session. Your mind will wander. Your dog (and cat) will know and feel it. And the negative effects of this can be enormous. It takes time and practice to become fluent at anything. It takes a concerted effort to change our habits and our reactions. But you can practice being present! There are a number of ways that you can learn how to do this, from mediation to body awareness, but for the sake of brevity we won’t go into all of those in this post. Instead, I’ll mention a couple of common situations that people encounter often. In each scenario, you get to choose how to respond. You can stress out and become reactive to them (because you clearly have other things to worry about, and now your kid/cat/dog is adding to your worries). You can take a deep breath, slow down, look at them calmly, be open, be present, and be there with them. When we choose the latter, we are shifting from our fearful and reactive mind to our conscious and loving mind. If you can do this you will find that in that moment there is only you and them. There is nothing else. They get your full focus. Then you can go back to what you were doing, but you are doing it out of love. You can fiddle with your phone the entire time. You can be full present with your dog. You can enjoy and appreciate your time together. You can notice subtle behaviors. 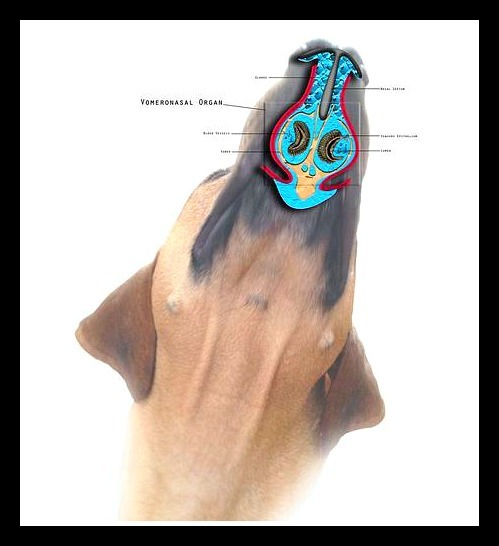 You can learn where your dog enjoys sniffing, and where your dog tends to avoid. 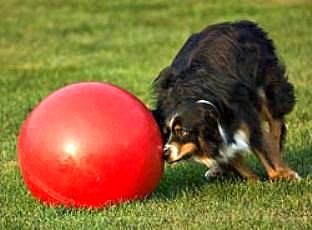 You can discover new sights, sounds, and scents with your dog. You can walk together. Being there now, in that moment is a choice. We get to choose this a thousand times a day. We get to choose where we are. We get to decide if we want to appreciate who is in front of you. It’s in that moment where you can be grateful for that moment with him/her. Or you can let that moment pass you by. A thousand times a day. It’s a choice we all get to make. When we are fully present we are allowing their presence to be enough for us. When we are fully present we are fully engaged. We are saying to our loved ones, “I care enough about you to be here fully with you now.” We are saying to them, “Nothing else is more valuable than you and me right now.” When we are fully present we are releasing our worries, regrets, frets, and concerns. When we are fully present with our pets, we are saying that we value their presence. And we are saying that their presence is enough for us right then and there. Being Fully Present IS a Gift. As Conscious Companions, one of the most powerful and respectful things we can do is to be fully present with our animal companions. When we make a conscious decision to be mindful we are giving ourselves and the ones we love a gift. Mindfulness takes conscious and deliberate focus but the more you practice, the easier it gets, and the more joyful your life becomes. And I promise you: Your pets will feel it, too. Being mindful makes it easier to savor the pleasures in life as they occur. It helps you to become fully engaged in activities and be more aware of everything. It creates a greater capacity to deal with adverse events when they arise. It allows you to recognize and prevent stressful encounters, and conflicts. I sometimes briefly look back and think about how often I was not fully present with the people and animals who I loved. Many of them are gone now, but the ones who are still by my side will have the gift of my presence. When I am walking with Hocus, petting Albert, brushing Knox, or listening to my husband, mother, or brother, they will have all of my focus. My mind may wander sometimes, but I will consciously choose to come back to them. I will remember that their presence is a gift, and my presence is my gift to them. The Fourth of July Doesn’t Have to Be “Feline Fright Night”! The 4th of July is a favorite day of celebration for many people, but let’s be honest. It’s a day of terror for many pets. And while we’re at it, let’s be even more precise: the Forth of July might as well be renamed “Feline Fright Night” for most cats. So what’s a devoted cat guardian to do?? There is a cornucopia of clever advice for dog owners to help their canine companions on the Night of Assault on the Senses, but what about the cats?? Cats need help, too! Feline Fact: Hearing is a cat’s best developed sense. A cat’s sense of hearing is far more acute than that of dogs and humans! A cat can hear sounds up to 64,000 kHz. 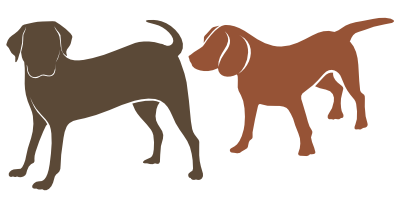 By comparison, dogs can hear sounds up to 45,000 kHz, while humans hear sounds only up to 23,000 kHz. So why does this matter? Well, it means that all sounds are much more intense for cats. Combine this fact with a cat’s lack of understanding (or appreciation) for a day dedicated to deliberately making things explode, and you have the perfect recipe for a full on Feline Freak Out. Here’s the good news: family festivities such as the 4th of July don’t have to become the Feline Fright Night to our kitty friends! There are many things that you can do to help your feline family members successfully cope with the Big, Bad Booms and Bangs this weekend. Below are some of my most valuable tools to help you become a Conscious Companion, and change Fourth of July Fright Night into a stress-free experience for everyone in the home! 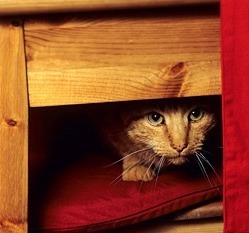 How to Make Your Home a SAFE, CALM Haven for your Feline BEFORE The FIREWORKS Begin! Keep Kitty Indoors! Even the savviest of kitties can become startled, scared, disoriented, or confused and stray far from home when those frightening sights and sounds begin. More pets go missing on/after Independence Day than any other day of the year! Why risk it? Keep your cats inside the day and night before, during, and a few days after July 4th. Be aware that Independence Day is on a Friday this year. It’s a safe bet that the firework festivities will last long into the weekend, so be sure to keep your Pet Guardian guard up! Don’t assume that once the 4th of July passes, that the booms and cracks have passed, too. Be ready for anything! Create Safe Zones. 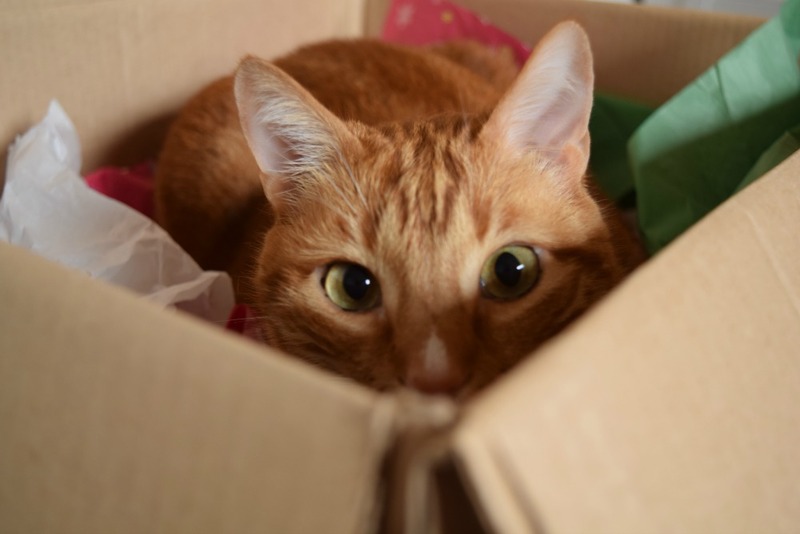 – Make a Feline Fort Hideout! Set up a “fort” or safe place of refuge for your cat(s) in the home. If you don’t have a “safe room” yet, I strongly recommend that you create one today. It can be as simple as a chair covered with a blanket, a comfy “hidey” spot in the back of the closet, the bathroom, or a covered crate that feels like a cozy kitty den. Even the space underneath a bed can comforting to cats. Be sure to set up this Safe Zone away from windows where the sights and sounds are loudest and brightest. Acclimate them to this safe zone before the firework festivities begin. 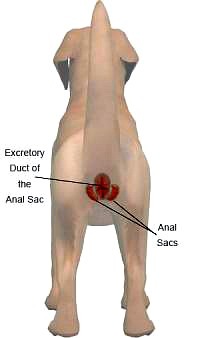 Offer treats and attention when they are in this area. By doing this, you are creating positive feelings with this safe zone. TIP: If you are not sure where to set up this safe zone, observe where each cat chooses to retreat when they are over stimulated. Ask yourself: Where do they go when company comes over, the big game is on TV, or when a storm hits? Where do they hide? That’s where you want to build Fort Hideout! TIP: If you have a nervous kitty like we do, prepare ahead of time for their comfort and safety. Make sure they have their favorite cozy hideaway ready. If they love boxes, provide one or two for them to explore. You can also consider adding a dash of catnip to get them relaxed and increase their confidence! Remember that some cats become relaxed on catnip, while others can become very wound-up. Play Calming Music. Soothing classical music is beneficial for many species. Therapeutic music such as Through a Cat’s Ear and iCalm for Cats has been scientifically proven to reduce anxiety and have calming effects on cats! 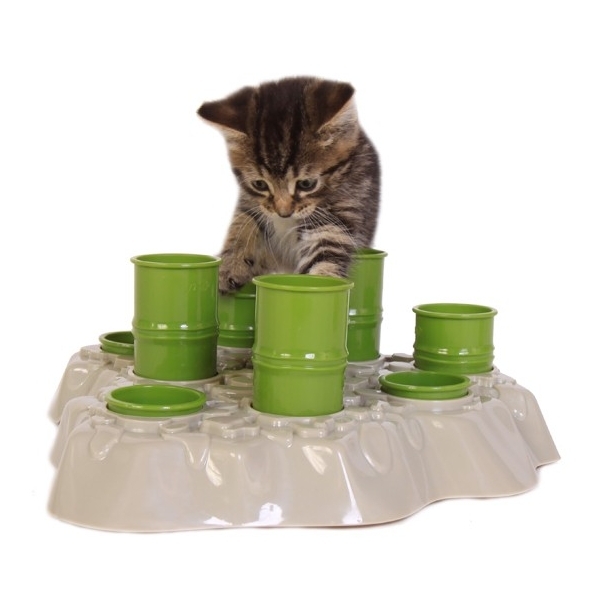 It is psycho-acoustically designed and clinically demonstrated to calm the feline nervous system. However, it’s most effective when you play the music well before the fireworks begin, at a time when the cat or dog is already relaxed. Animals will start to associate the music with being calm and content. Then you play the music a couple of hours before the fireworks start and continue to play through bedtime. Check out these free sound samples! NOTE: Don’t just crank up any old tunes or the T.V. in an attempt to make the inside of the house louder than outside. That will only create more stress on the cats. Keep the energy inside peaceful and calm. Consider homeopathic calming remedies. Homeopathic relaxation supplements such as Feliway (cat appeasing pheromones), Spirit Essences, HomeoPet, and Pet Rescue Remedy are very helpful with calming an cat’s nerves on the big bad boom day. We use Spirit Essences —This product does wonders for stress levels! Check with your veterinarian before you use them. Homeopathic remedy can provide relief from fear of Fireworks. Note: Feliway is a liquid synthetic copy of the feline facial pheromone, used by cats to mark their territory as safe and secure. You can spray it on their favorite napping spots to make them feel more secure. Note: If your cat has reacted very badly to fireworks, etc. in the past, you can consider discussing stronger medications with a veterinarian who specializes in feline anti-anxiety medicine. I recommend trying the above products before rushing to the vet for prescription meds! We have seen incredible success with these products. Medication alone is generally not going to “fix” much of anything. It’s can be a helpful intervention, but not a specific treatment. It needs to be paired with counter conditioning techniques. Utilize Tactile Tools. There are two wraps on the market that reportedly help pets with noise phobias. The original Anxiety Wrap uses acupressure and maintained pressure to reduce stress. Thunder Shirts have been successful with calming many cats. Over 85% of Thundershirt users see significant improvement in noise anxiety symptoms. The Storm Defender Cape has a metallic lining that discharges the fur and shields them from static charge build-up before and during storms. Rubbing an animal down with scent-free dryer sheets can help with reducing the static charge as well! Thundershirts can be very helpful for many cats. Reduce the Visual Assault. Close the windows and blinds or anything around the house that will help to eliminate the visual assault on their senses. Turn on lights around the house. This will also help to block out the flashes from the fireworks. Microchip your cat and be sure I.D. tags are updated. Be calm. Our companion animals are very in-tune with our emotions. If we are stressed or anxious about the upcoming booms and bangs, I can guarantee you that they will become anxious and stressed, too. Know the signs of STRESS! Cats can display their anxiety and stress in a variety of different ways. Be a Conscious Companion; learn to recognize their individual stress signals, which may include any (or all) of those listed here. Comfort Your Cat! If your cat is displaying fear and anxiety when the fireworks begin, stay calm and stay near them. Contrary to some belief, this is NOT rewarding fearful behavior! Distract them! Start playful game and break out the treats if they are beginning to show signs of fear and anxiety. 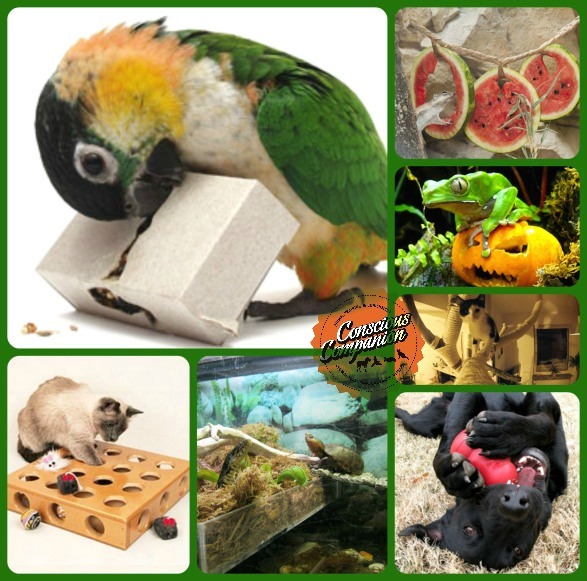 You can also offer novelty items such as cat nip, special treats, and enrichment toys. Grab some of that recycling material and create a fast, homemade puzzle toy! The idea here is to turn Fright Night into Fun Night! TIP: Withholding these toys for a few days ahead of time will make these treats even more special on the Night of Assault on the Senses. Check out more tips of how to be a Conscious Companion, and change “Fourth of July Fright Night” into a stress-free experience for everyone in the home! 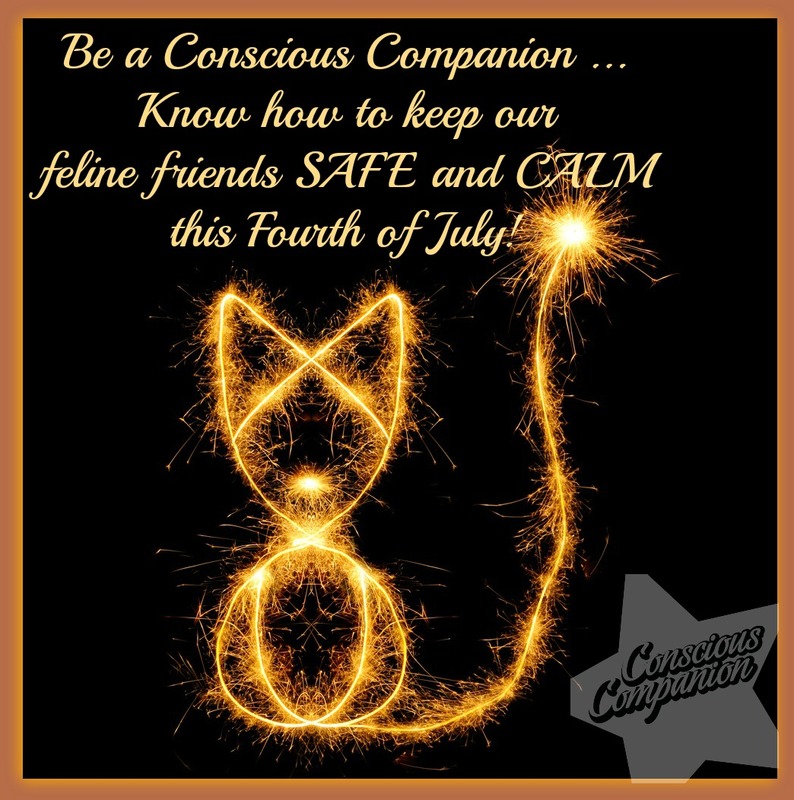 How do you keep your feline family members safe on The Fourth of July? Please share your tips!